Porto, Portugal is a steep hillside town full of pastel homes with narrow winding streets, colorful facades and azul tile. Porto has a gorgeous riverfront promenade with spectacular bridges, Port wine cellars, it is home to the most beautiful McDonald’s in the world and has sprinklings of Harry Potter throughout the city. So much to see and do… so little time. 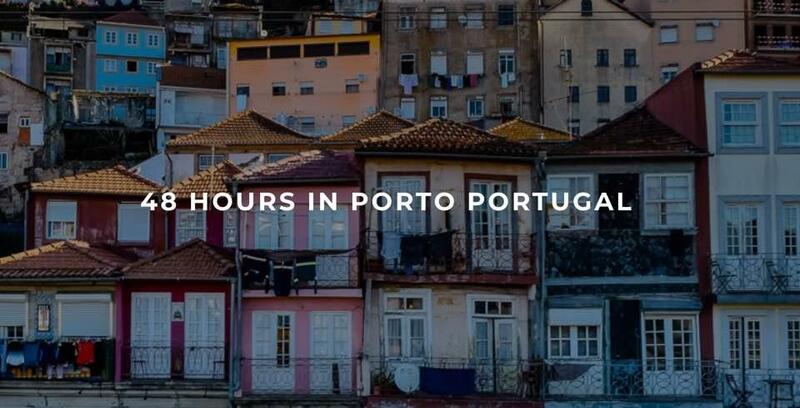 Here is how to spend 48 hours in Porto Portugal. Arrive at Porto Airport and take the Metro into town. Exit customs and take elevator to -1. Walk through the car park pay stations and enter the Metro hall (100 yards). Take the first escalator on the left up to the train. Buy an Andante ticket from the machine. There are instructions in English; cost of a single journey is €2.45. Keep the card, it is rechargeable and just cost you .60 cents. Validate the ticket at the yellow machine. Take the purple line, it is a 30 minute ride. Consider going to the Metro Counter inside of the Tourist Office in the arrivals hall to purchase an unlimited card for 24 or 72 hours with unlimited trips on the Metro, bus, funicular and some trainChoose a hotel close to the Porto São Bento Railway Station. It is a convenient place for transportation and there are several attractions nearby. Check into your hotel, grab a hotel map and business card in case you get lost and go see the city! Take Tram 1 to the beach. Grab a cup of coffee, watch the waves and take a walk along the pergola before returning to the Ribeira District.Walk across the Ponte Luis Bridge. Stop at Jardim de Morro or Miradouro de Serra do Pilar for photos of the Ribeira District before taking the cable car down to the Port Wine Caves.Spend the afternoon enjoying Port Wine or take a ride on a rabelo. Begin at Porto Cruz to explore the exhibits and take the simulated flight over the Douro Valley. Partake in a tasting and relax on the terrace with a view over the river. Take an audio tour the wine caves of Taylor’s Port and enjoy 2 tastings. Visit the Underground Museum for a unique wine cave experience. Churchill’s, Croft, Offley, and Sandeman are all well-known caves that offer tastings. End the evening at Cálem and enjoy a tasting, tour and Fado show. Photograph Porto São Bento Train Station, the beautiful McDonald’s Imperial and Liberdade Square. Notice Praça de Lisboa on the roof of a shopping center as you walk to Livraria Lello bookstore (Harry Potter). Be there at opening time; expect a line and crowd inside. Walk past the Fonte dos Leões (Fountain of the Lions) on your way to the azul tiled Igreja do Carmo. Be sure to notice the tiny house between the two churches and take a quick look inside. Stop to photograph Clérigos Church. Walk up the narrow staircase to the viewing platform, or save your legs and continue on to enjoy the view from Miradouro da Vitoria. See the Arab Room at Bolsa Palace and check out the gold dusted interior of Church of St Francis. Walk toward the river and wander the narrow alleys of the Ribeira District. Stop for a late lunch in Ribeira Square. Walk under the Luís I Bridge to the Funicular of Guindais and take a ride up along the old city wall (Muralha Fernandina). Then make your way to the Cathedral and explore the azul tiled cloisters. Head over to Mercado do Bolhão and sample Portuguese food. Continue on and photograph the azul tiled Chapel of Souls before heading to Rua de Santa Catarina for souvenir shopping. Sherianne Higgins is a travel writer who resides in Southern California. Her blog, Out of Office, is full of travel itineraries and city guides to assist busy professionals in escaping the office and traveling.